All of these books are available at the Brookline Public Library! You can also find them at local retailers and online for purchase. There are, of course, hundreds more books with fantastic math connections, but these will get you started. First published in 1968, Ten Black Dots is a counting book, a book of simple rhymes, and a book of everyday objects. In this classic book, a winsome, winning inchworm is proud of his ability to measure anything under the sun. A clever tale about the jungle beasts learning to count, showing once again that being strong is not the same as being smart. 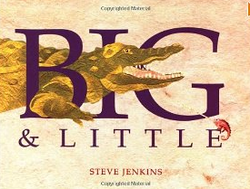 A gorgeously illustrated book that shows animals that are related to each other but vary greatly in size. All animals are illustrated on the same scale, so readers can compare them throughout the book.